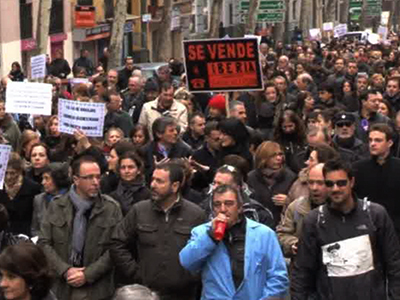 Spanish protesters, seeking to stop a wave of evictions, are now knocking on politicians' doors. They’re standing up against the harshness of the mortgage law in the recession-hit country. Protesters gather at the porches of lawmakers or at their workplaces, dressed appropriately to convey their message and holding signs with their demands. 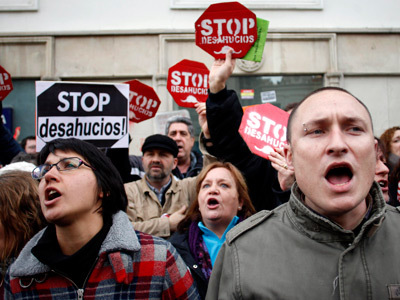 The new protest strategy is called 'escraches' and has arrived in Spain from Argentina. The word 'escraches' literally means 'denunciation' in Argentinian slang. The 'doorstep' and 'targeted' rallies will have more effect on the lawmakers than massive gatherings in city centers, organizers believe. 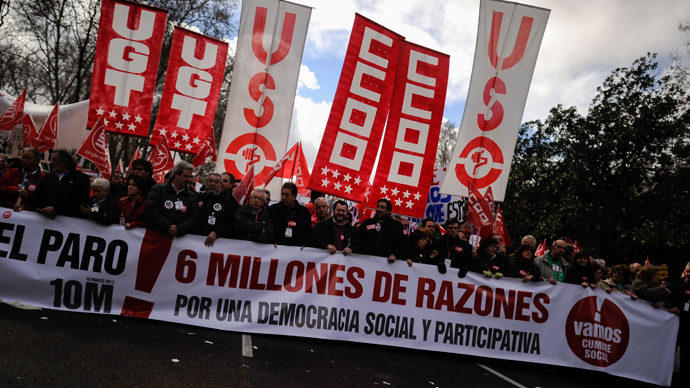 "There is a certain lassitude - the demonstrations grouping together tens of thousands of people don't seem to be as effective as before," Tomas Alberich, a sociology professor at the University of Jaen, told Reuters. 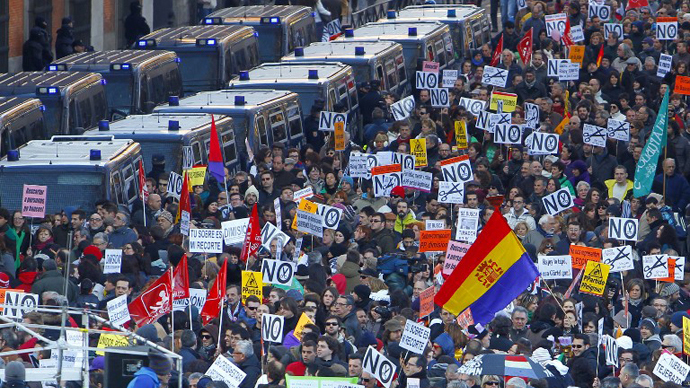 The protesters want the government to change Spain's laws and end the evictions, allow insolvent homeowners to write off their debts by surrendering their homes and transform repossessed flats owned by banks into social housing. Under the current law, a bank can pursue a mortgage holder to pay off the remaining balance of a loan if the value of the seized property is not enough. Moreover, the debts are not even cancelled in death, making Spain's mortgage laws way harsher than in many other countries. 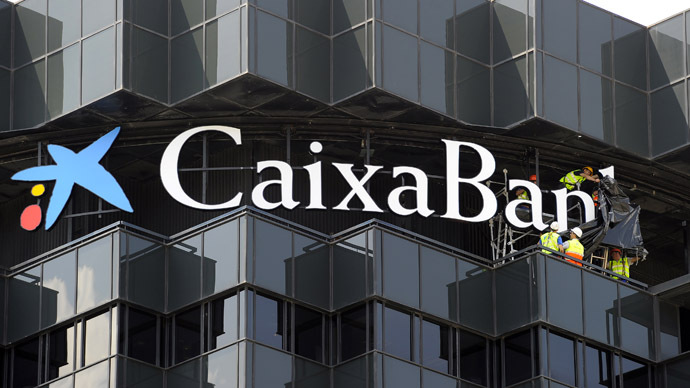 The grass-roots organization in Spain overseeing the 'escraches' is The Platform for Mortgage Victims - or PAN in its Spanish acronym. They insist they do not promote violence as they move from one door to another with red and green placards in their hands, symbolizing the 'yes' and 'no' vote in parliament. "Our protocol is to go and try and talk to the member of parliament, not all at once, but taking them aside and putting them face to face with a real case of someone who has been evicted," David Cobo, a spokesman for PAN in the town of Alcala de Henares near Madrid told Reuters. The lawmakers, however, are less than excited over this new strategy. "We all have a right to defend our ideas, but intimidation can never be a form of participating in public issues," Prime Minister Mariano Rajoy, targeted by an attempted protest at his wilderness retreat last weekend, told his ruling People's Party on Wednesday. "I condemn these acts," he stated. 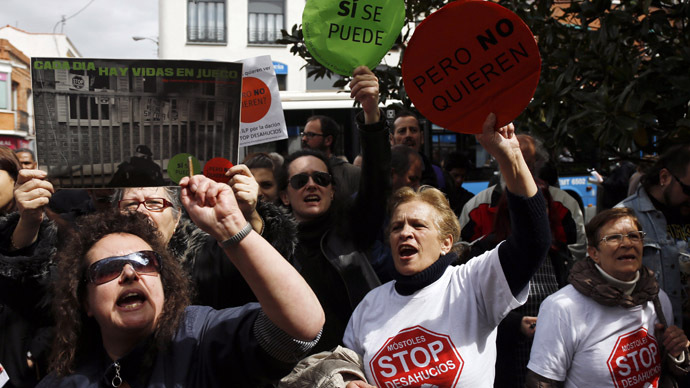 Spanish courts have executed 252,826 eviction orders -- including a record 75,605 last year -- since 2008, when the recession broke off. As millions lost their jobs, they failed to make their mortgage payments and were evicted as the result. The evictions were followed by a whole string of suicides, and that's when PAN started their activity. Before 'escraches', PAN staged demonstrations at houses where people were about to be evicted, to specifically prevent police from reaching the premises.